Add some depth to your diving with our PADI Deep Diver Course. Learn how to dive better, utilizing more streamlining of your gear and your body. Dive with more confidence as you engage in dives using redundant breathing systems. Learn how to properly plan dive plans, over-plans, manage emergencies and equipment related failures and self rescue techniques. Upon Request. Contact the shop to find out when we are running our next courses. Our Deep Diving program focuses on skill proficiency and ability before we go deep. 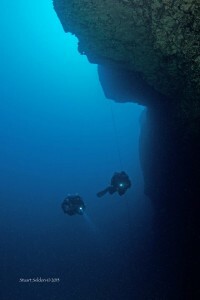 Upon certification, divers will be certified to dive to 130′, so proper skills, buoyancy, dive planning, self rescue techniques are needed first. We will spend 1 day in shallow water working on trim, posture, buoyancy, management of emergency bailout systems, double tanks, sidemounted tanks, or high capacity single tank with h-valve. Divers will learn how to deploy a Surface Marker Buoy (SMB) from depth with a safety spool and simulate decompression stops in an “over-plan” scenario. Depth stabilization is a must, as divers cannot waiver up and down in their buoyancy. Buoyancy must remain constant, divers must be able to maintain depth within 2′. If a diver does not have the skill, experience or buoyancy to safely engage in deep diving activities they can cause harm to themselves or their dive buddies. Our Deep Diver course is structured in a different and more thorough way to make you the best diver you can be and prepare you mentally and physically for deep diving activities. Want to know more about PADI Deep Diver Specialty?